From March 30 through April 3, the eyes of the nation will be on Denver as the city hosts the 2012 NCAA Women's Final Four and national championship that will be decided on April 3 at Denver's Pepsi Center. The Women's Final Four is a celebration of the best of the best in women's college basketball. The “host city” and epicenter for all Women’s Final Four fan and community activities will be staged FREE at the Colorado Convention Center. Entertainment, concerts, food, licensed merchandise, autograph sessions, youth clinics, exhibits, games and interactive displays for the entire family. FREE Jewel concert Saturday, March 31 at 5:30 p.m. Talent Showdown™ Refreshed By Coca-Cola Zero™ on Center Stage Saturday, March 31 at 1 p.m.
March 30-31, 10 a.m. – 7 p.m.
April 1, 11 a.m. – 7 p.m.
Watch the Women’s Final Four teams practice, get autographs from the Women’s Final Four student-athletes and coaches, watch a Battle of the Bands competition featuring pep bands from the four institutions displaying their school spirit and see the WBCA High School All-America Game featuring the nation’s most gifted female high school basketball players. Doors Open – 9:30 a.m.
Open Practices – 11 a.m. to 3:40 p.m.
Autograph Sessions – 10:45 a.m. to 3:55 p.m.
Battle of the Bands – 3:45 to 4:15 p.m.
WBCA High School All-America Game – 4:30 p.m.
March 30, at Denver’s Buell Theatre, walk the red carpet and share the charismatic entrance of the Women’s Final Four teams. Sage Steele, host of ESPN’s Sports Center will emcee the event and the Silhouettes (America’s Got Talent runner up) will perform. FREE team grand entrance (red carpet presentation of teams) begins at 6 p.m. Event starts at 6:30 p.m. General admission tickets are $20/person. Run or walk the 4K (2.49 miles) course which begins at Civic Center Park. Held in honor of the late North Carolina State University head women's basketball coach Kay Yow. The race benefits cancer research through the Kay Yow Cancer Fund®. The first 1,500 registrants will receive an event t-shirt donated by Nike™. All participants will be eligible to win prizes and awards. Online registration is $20, with on-site registration $25. The first 1,500 registrants will receive a 4Kay Run T-shirt donated by Nike. March 31, at 9 a.m.
Open to youth ages 8 to 16. Participants will receive instruction from NCAA coaches and student-athletes and get valuable information on fitness, healthy lifestyles and sportsmanship. Clinics take place at ThunderRidge High School and South High School. All participants will receive a FREE t-shirt and Wilson® Sporting Goods Co. mini-basketball. March 31, 8:30 – 12:30 a.m. Youth 18 and under will DRIBBLE through Downtown Denver from Civic Center Park to Tourney Town. The first 2,500 participants receive an event basketball and t-shirt, donated by the NCAA and Wilson® Sporting Goods Co. Come early (pre-registration check-in starts at 10 a.m.) to enjoy the FREE entertainment, activities and fun! 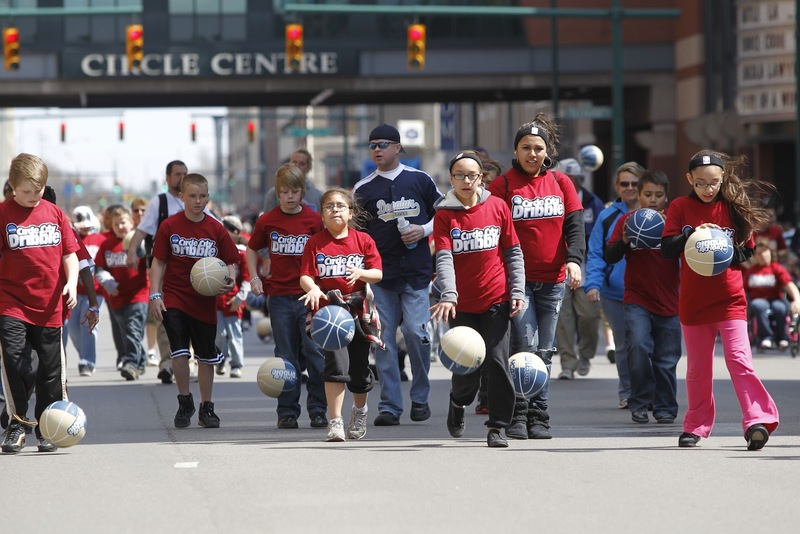 Tourney Town will welcome dribblers and fans with live music and performances throughout the afternoon. Volunteer For Women’s Final Four! To find out why "It's More Than Three Games," visit NCAA.com/finalfour for ticket, event and volunteer information. Come as early as 5pm to the Buell Theater galleria for some special welcoming entertainment.